When TJ and I first got engaged just about the only thing we agreed on about the whole wedding deal was the honeymoon. We did not want to go to some hot crowded resort where the only alone time we got was in the hotel room. We both love the outdoors and we had always wanted to go camping together, which was weird that we hadn't done this together already. Once that was figured, the next place was where. When I was in high school I went on a canoe trip up to Missinippi and thought it was so beautiful. Who knew Saskatchewan was not all flat. Always wanted to go again, so I actually Googled Missinippi fishing resort and came across Vickie and Bart's website. I called them a couple days later and found out it was completely in our price range. I think TJ and I were as excited to hop on that little plane and put ourselves in the middle of nowhere with nothing but clothes and fishing tackle as we were to get married, maybe not as excited but pretty close. Being the fact we had never been there before, we didn't quite know what to expect which led to a lot of questions. What to bring, what kind of amenities we had, what food should we take, what do we cook with, and everyone was very patient with us. When the day finally came we were super excited and may have showed up two hours too early. Left us with a lot of time to go check out Churchill River and swimming in the lake. When we got on that plane I knew the wait was all going to be worth it. I was very nervous, never having been on a plane before, but I am pretty sure our pilot was one of the nicest guys I met. He pointed out all the different lakes and kept me talking so I wasn't freaking out. Vickie, Bart and Jake all greeted us at the dock and showed us to our beautiful, four bedroom and two bath cabin, so gorgeous. We had been upgraded to luxury. We stayed for four days and did not want to leave. Everything was so great from the shore lunches with our awesome guide, Jim, to the homemade cookies left on the counter from Vickie. Whenever we needed anything Vickie and Bart always were helping us out. Two of the kindest people I know. We didn't have the best weather but would not have changes a thing. We fished everyday and caught something every day as well. It was great being able to spend time alone together on our honeymoon. TJ and I both believe that is how it should be. A great view of the open lake from the deck and hearing nothing but birds and waves, made for an incredible honeymoon. We are looking forward to going back next year and taking our family with us. Couldn't have picked a better place to start our lives together. Just a short note to thank you both for providing another wonderful fly-in fishing experience. Todd and I had our usual fantastic time at Pine Isle. The accommodations, shore lunches, evening meals, and atmosphere in general are unsurpassed. We both caught lots of fish, too. Your gracious hospitality is incomparable and very much appreciated. Hope we can join the group again next year and will look forward to seeing you both then. �Just wanted to say thanks for another great trip. Your fishing camp makes the northern experience that much better. It was my nephew Matt's first trip up there and he is still pumped about catching that 29� walleye and really that is something to be proud of. It's nice to know that we will always catch lots of fish along with your great hospitality and beautiful camp. We'll be back next year. "This has been our second year as guests at your fishing camp in beautiful northern Saskatchewan. We have had the pleasure of enjoying your warm and friendly hospitality and the superb fishing experiences provided by yourselves and your staff. We look forward to sharing these wonderful times with you for many years. By the way, your desserts are fantastic." "Pine Island can't be compared with any other fishing camp because thanks to the host and hostess, Bart and Vickie, and the modernization of the accommodations, nothing else can compare. The accommodations are secondary to the quality fishing and especially with the world class guides and particularly, Richard Roberts." 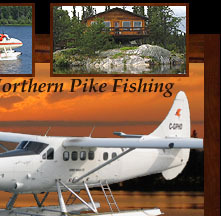 "Pine Island Resort offers superior, very cost-effective accommodations and wonderful walleye and northern pike trophy fishing. The cabins are warm, roomy, have wonderful views of miraculous scenery, and have hot and cold running water and electricity - a real treat in a 'northern outpost'. The guides and equipment are first rate! Most importantly, the resort managers, Bart and Vickie, are the best and make the stay quite pleasant and memorable." "The greatest fishing experience of my life. Beautiful scenery, friendly people and wonderful accommodations. Pine Island Resort is the closest thing to heaven that I have ever seen. "What a super fishing trip! We were welcomed at Otter Lake, flown to Pine Island and shown to our cabin, The Kingfisher. Hazel proved to be an excellent guide and cook for our shore lunches. Vicki and Bart, you went beyond the call of duty to make our stay so wonderful. You are all very special. Thanks again!" "We love Pine Island! We travel with another couple who have the same interests as we do. Our husbands are the fisherman and we enjoy sitting on the deck in the sun reading, exploring the Boreal forest, soaking our feet at the dock with a glass of wine, and hearing all of their stories when they come home in the evening. I can't believe that there are hardly any mosquitoes or bugs up there. Everyone on Pine Island makes us feel like family and our year wouldn't be complete without going up there. There really is no other place like it and we've been to many before we found this paradise." "My heart starts pounding every time I think about that giant pike I caught.